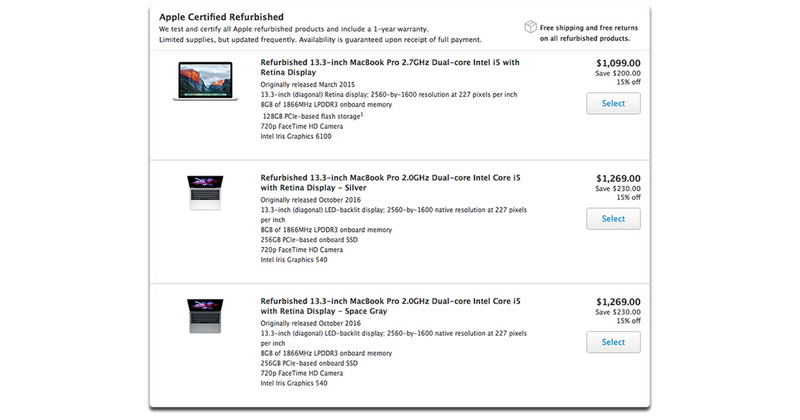 If you’re looking to save some money on a 2016-model Retina MacBook Pro Apple has some available on its refurbished store. Right now 13-inch non-Touch Bar models are available, but inventory is limited. Last night you could pick up a Space Gray 2.4 GHz dual-core Intel Core i7 model with 16 GB RAM and a 1 TB SSD for US$2,209, which is $390 off its regular $2,599 price tag. Today, the Space Gray 2.0 GHz dual-core Intel Core i5 model with 8 GB RAM and a 256 GB SSD is still available for $1,269, or $230 off its normal $1,499 price. Odds are they’ll go fast, so don’t procrastinate if you need one now.